This article is the translation based on the original material by Irina Linnik. We decided that these thoughts and considerations she wrote about can be quite useful for our English-speaking audience. 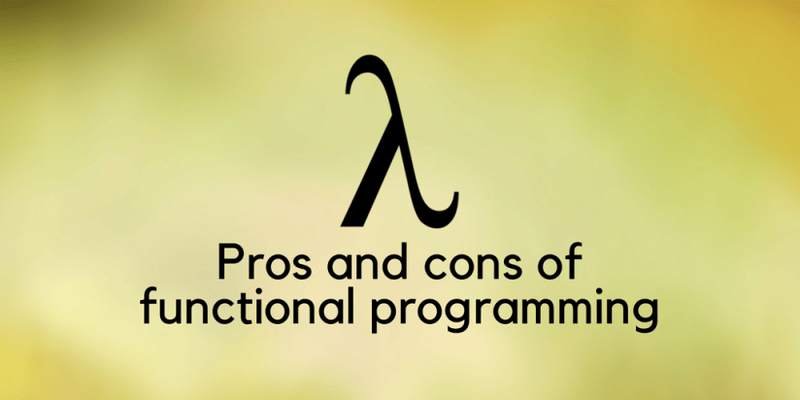 Here we will tell you basic pros and cons of functional programming and show why you should consider it. So, what functional programming is and why it became so popular? Let’s take a closer look. It is worth to start from the start. it’s easier to test (although learning from scratch is not easy). the prevalence of declarative approach rather than imperative approach. Pure functions are deterministic functions without side-effects. A deterministic function means that it returns the same result for the same set of input values. For FP, the properties of such functions are very important. For example, pure functions have reference transparency – you can replace the function call with its final value, without changing the values of the program. Function composition means the process of combining two or more functions in order to create a new function or perform calculations. What is shared state? The main problem of shared states is to understand the effects of a function. You need to know the whole history of each variable that the function uses. Therefore, functional programming avoids shared states, instead relying on immutable data structures and pure computations to extract new data from existing ones. Another nuance that occurs when working with shared states – changing the order of functions calls can lead to the avalanche of errors. That is why avoiding shared states with help you to avoid this problem. Immutability is the core of functional programming (don’t mix it up with constants). ‘const’ creates is used for variable’s name that cannot be reassigned after creation. But it does not create immutable objects. You will not be able to change the object to which the binding relates, but you can still change the properties of this object. Side-effects mean that in addition to the return value, the function also interacts with an external variable state. Why FP avoids side-effects? Because in this way the effects of the program are much easier to understand and test. Haskell, for example, uses monads to isolate side effects from pure functions. The imperative approach follows the principle of workflow control and answers the question ‘how to do’. The declarative approach describes the data flow and answers the question ‘what to do’. In addition, the imperative code most often uses instructions (operators), and declarative relies more on expressions. So, we seem to figure out what functional programming is and what you need to know about it. And before we move on to discuss its advantages, let’s go through the shortcomings. What is the essence of the stereotype that ‘functional programming is unnatural’. Writing a functional code is like writing the code backwards. And it’s more similar to solving the puzzle, rather than explaining the process to a computer. In fact, this is rather a subjective attitude to the functional programming formed by people who do not want to spend enough time to understand the FP nuances. There is no efficient vocabulary for functional languages. Purely functional vocabularies work slower than the hash tables, and for some applications, this can be critical. Secondly, there is no purely functional weak hash map. Nevertheless, for most developers, this defect may remain unnoticed. Functional programming is not suitable for algorithms in graphs (due to slow work) and in general for those solutions that for decades were based on imperative programming. Check the lists of FP disadvantages on Quora and in the article by Alexander Alvin too. Okay, the last point we mentioned is not very related to cons because we cannot blame functional programming for what it was not meant to be. Functional programming is famous for its high-level abstractions that hide a large number of details of such routine operations like iterating. This makes the code shorter and, as a consequence, guarantees a smaller number of errors that can be tolerated. In the functional programming, there is a smaller number of language primitives. Well-known classes are not used in FP. Instead of creating a unique description of an object with operations in the form of methods, in functional programming, there are several basic language primitives that are well optimized inside. Due to the language and structures flexibility, as a functional programming developer, you can bring the language closer to the problem. And not vice versa. In addition, FP offers some new and interesting tools for solving complex tasks that OOP developers often neglect. Working with functional languages provides accurate and fast code writing, facilitates testing and debugging. You’re working with high-level programs, and the functions signatures are more informative. You can find other functional programming benefits here. These days developers try to solve the problem of parallel processing and working with Big Data. By parallelizing the processing of these data you get the desired result quite fast. Plus, do not forget about decentralized (distributed) calculations like blockchain. Due to functional programming principles, the functional code is the most suitable for such computations. The use of all basic API techniques facilitates the parallel execution of the code and its support. In the beginning, functional programming was used only for solving specific problems. But now it is applied even in classic projects created by large IT companies. Here you will find some tips that will help you to start with FP. Relax. At first, it will be difficult. Put aside what you knew before and try to learn new approaches and principles. Start with learning Haskell and then go to Scala (or F #) for better understanding the principles of functional programming. Find more useful resources to learn elixir we mentioned in Elixir from a Rubyist’s perspective article! Not so long ago we have published a short comparison of Elixir and Ruby. That might be a useful reading too!